O chardinet da Formiga is a sustainable rural tourism house (bed and breakfast cottage) located in the Central Pyrenees in the small village of Charo, in (what we call) the Comarca of Sobrarbe. Its proximity to impressive natural parks: Parque Nacional de Ordesa y Monte Perdido, Parque Natural Posets-Maladeta, Parque Natural de la Sierra y Cañones de Guara, where you can enjoy infinite treks, birdwatching, high mountain and adventure sports, and other experiences available all year round. Also the comarca is full of interesting historical and cultural places such as the medieval village of Ainsa. Together, all of this makes O Chardinet da Formiga a location that can’t disappoint. The house O Chardinet da Formiga (the ant’s little garden) dates back to the seventeenth century and has been restored to preserve the original structure and look by using traditional and environmentally friendly materials such as stone, wood, natural hydraulic lime or natural pigments. Furthermore, the careful attention of its owners, especially for decoration and a tasty cuisine, make it a friendly atmosphere to breathe in. 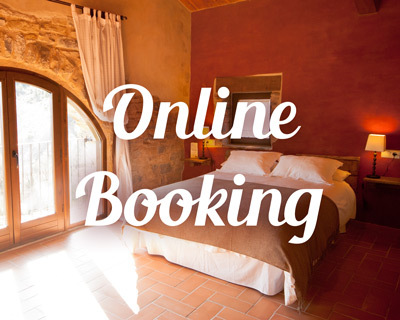 Booking tel. 974 341 998 or click en ON LINE. O Chardinet has five bedrooms, all of them with a complete bathroom built-in and exterior views of the valley, clear sky and the little old stone made village. The vaulted halls of the old stalls have been restored as a common area for guests and are equipped with all required elements for a relaxing break: armchairs, board games, wood stove, soft music and books, guides and magazines. There are also maps to plan your own visits around the area, treks, or other adventure sports. You also may order a cup of tea, beer,”orchata”… or some homemade pastries. La Fueva, also known as El Valle de la Fueva or in the local aragonese language, Val d’a Fueba, is located in the northeast of Sobrarbe‘s region, right next to Ribagorza and a few scanty kilometres from the medieval Villa of L’ Aínsa. La Fueva is a valley drained by the Usia and Salinar creeks and bordered to the north by Sierra Ferrera and Peña Montañesa. Below one can find the Sierras of Campanuel, Formigales, Trillo and Clamosa. Other creeks cross these Sierras, giving the character to this valley of lands inherited from the former early medieval counties. This particular orography has facilitated the valley’s isolation up to recent dates, preserving its genuineness and freshness in each of its corners, in each of its 25 inhabited villages and in each of the abandoned ones, and in each of the treasuries that the history has legated in every cultivated field. La Fueva is a nearby valley far from the multitudes and also a calm valley with a special location from which the most emblematic locations of the Pyrenees are easily accesible all year round thanks to its moderate climate.